To be honest, I never see myself as an athletic person. And when my friend challenge me to try his surf school first thing in my mind was, ok I need to find a model for the photo shoot, there’s no way I’m gonna learn to surf it’s really not my thing. After a good and convincing talk finally I decided to conquer my fear haha. Ok it’s time to start the lesson; since the hotel was located in front of Kuta Beach we just need to cross the road to reach to the beach. I do the pair lesson for beginner with my friend; we begin the lesson by the beach we start by getting to know about the board, the basic steps and the safety all the theory that we need to know. My instructor Rico was really friendly, helpful and most of all really patience especially with me haha. Ok the theory seems quite simple, it only took like 3 steps, make sure I stand in the middle of the board and just need to maintain the balance. But once we hit the water, that’s when the real challenge starts. 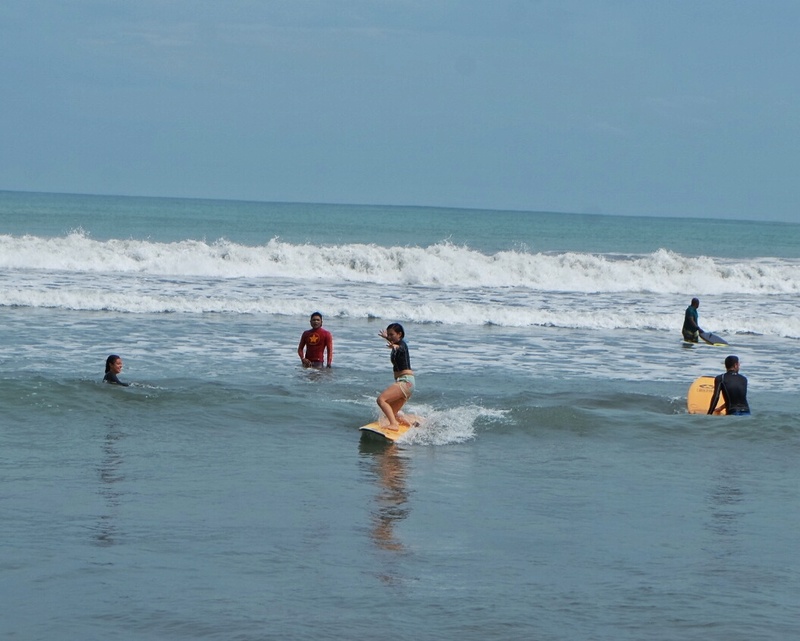 It’s quite hard just to carry the board with all the current and waves, but no need to worries for beginner we only use the small waves or the broken ones usually called the white water. During the session in the water it took only couple of time for my friend Yani to be able to stand up on the board, while for me I fell down so many times, luckily the water really not that deep and I can easy stood up each time I fall, my persistence and patience instructor keep encourage me to try again. It was quite exhausting but it was fun! After so many falls I decided to take a break at the beach then one of the crew ask me to try again because they want to take a video, my first attempt was another failure I almost made it to stand up on the board. Then I finally did it on my second attempt I FINALLY STOOD UP!! Yay.. Even though not with the right posture, at least I manage to stand up. Here’s a short video they took for my “glorious victory” 🙂 Haha.. Unfortunately we have to stop our lesson for that day due to the tide condition, so it’s time to get back to the hotel, return the board and take a shower before I head home. 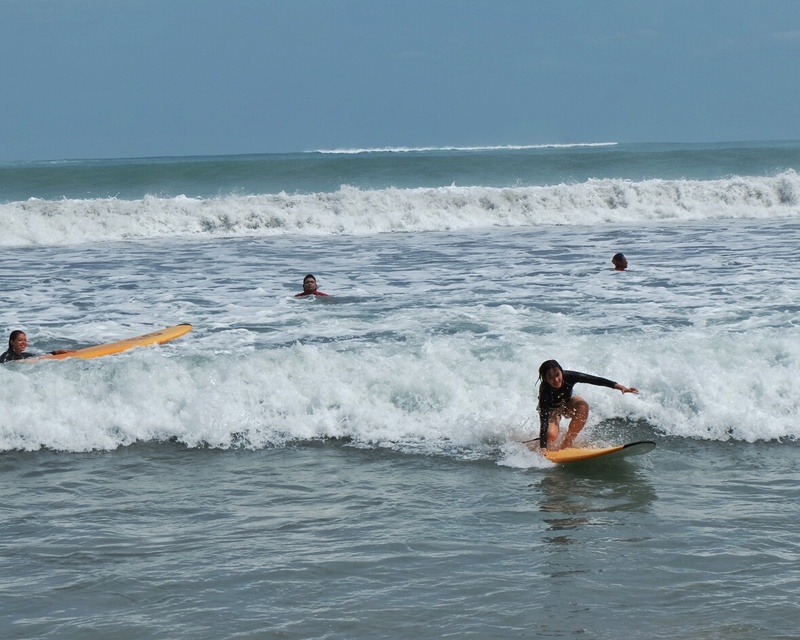 Thanks Odyssey Surf School for this fun and exciting experience!! I finally conquer one of my fear and you know what? 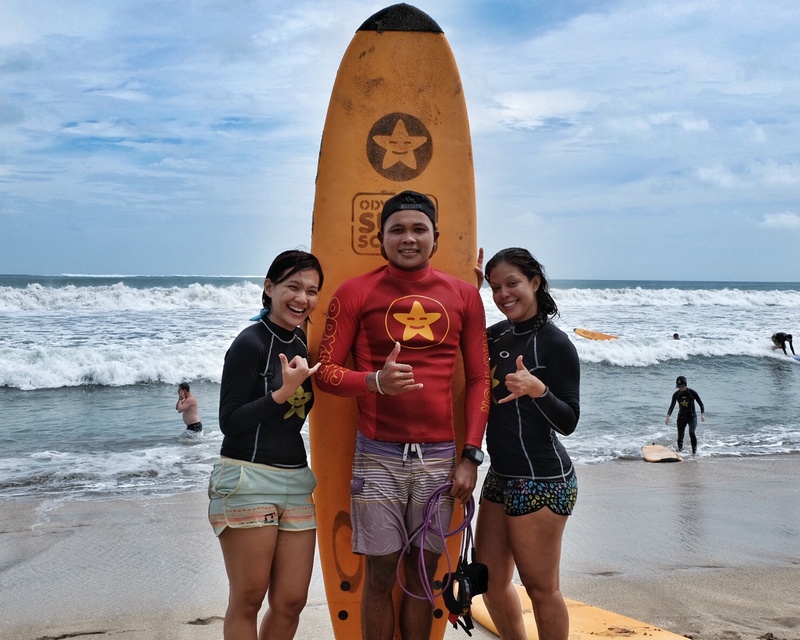 I actually wanna try it again :).Turns out Odyssey Surf School guaranteed that each student will be able to stand up on their first lesson and if we’re still not able to stand up they will provide an extended free surfing lesson.